Every year, Software Advice talks with thousands of owners and managers looking for the right fleet maintenance management software for their business. This provides us with unparalleled insight into the needs of these software buyers. 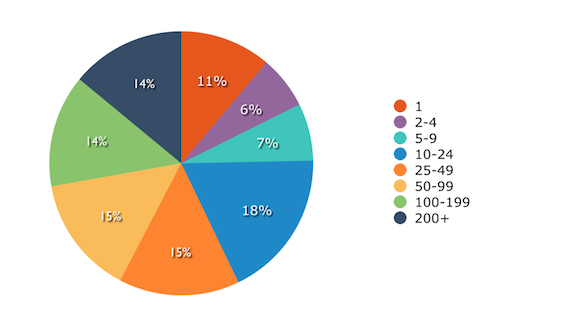 We recently analyzed a random selection of 385 of our interactions from 2013, in order to uncover prospective buyers’ most common pain points and their reasons for purchasing new fleet maintenance management systems. Here’s what we found. The majority of buyers (60 percent) use manual methods to manage their fleet. Nearly 80 percent of buyers want to improve efficiency by using software to organize data. Twice as many buyers are seeking Web-based software as are seeking on-premise solutions. 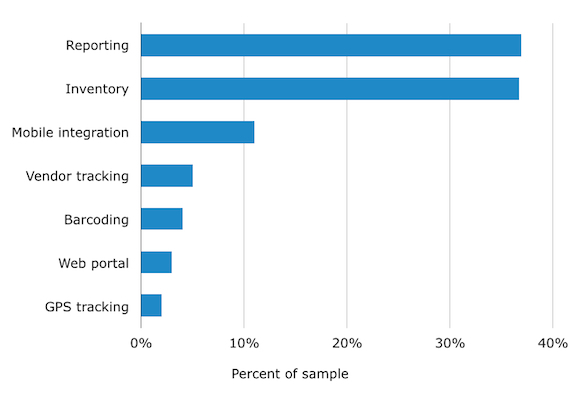 When asked what methods buyers currently use to manage their fleet, just over 60 percent say they use manual methods, such as spreadsheets or paper files. Much fewer—13 percent—say they already use a fleet management system (FMS). Another 16 percent of buyers have no formal system in place to manage their fleet. We also wanted to look at how many assets each buyer managed. The vast majority of buyers (72 percent) have fewer than 100 vehicles, while 28 percent have 100 or more assets to manage. David Koelsch is the principal owner of The November Group Corporation, a fleet management consultancy. He is also a certified automotive fleet manager (CAFM) through the National Association of Fleet Administrators with more than 25 years of experience. While not always the case, Koelsch says fleet managers who oversee fewer than 100 vehicles are more likely to use manual methods, and those with 100 or more will often outsource management to fleet-leasing companies, such as GE Capital Fleet Services, Donlen and ARI. Thus, Koelsch says, our findings are in line with greater trends across the industry. 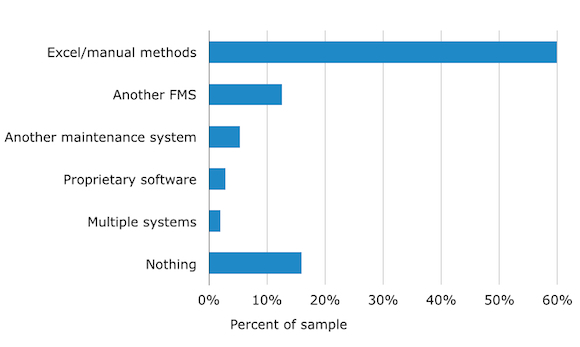 Perhaps unsurprisingly, almost half of the reasons mentioned (48 percent) state a desire to purchase a fleet management system to improve efficiency or become more organized, and 23 percent mention wanting to begin using software to “go electronic,” instead of using more cumbersome paper-based methods for their operations. Many fleet management software vendors offer different versions of their system with varying feature sets, or offer optional modules, such as inventory or work order management, that can be added on at an extra cost. Other systems support just one or two features, such as asset tracking, Koelsch says. This fragmentation of features within the fleet management-related software market could explain why so many buyers are looking for a more comprehensive system to fill the gaps. 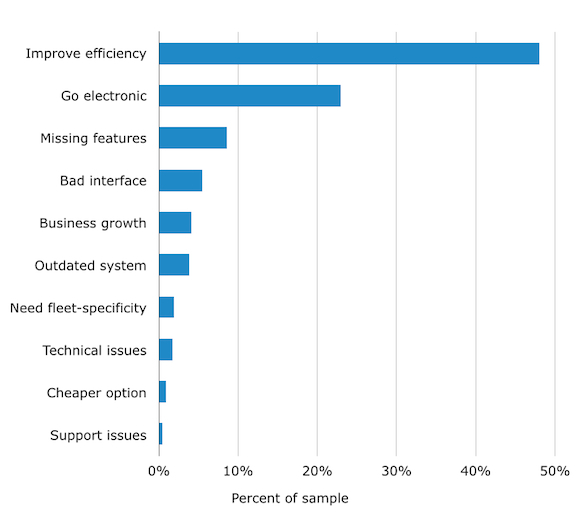 Next, we dug into the comments of those who said they want to improve efficiency with fleet management software, and found specific goals they are hoping to achieve. Just under 80 percent of the reasons stated that they specifically wanted the software to help them organize data in a single place for easier retrieval. About 11 percent of the reasons were to increase the speed of operations by reducing paperwork, and another 9 percent that they needed to be more proactive with maintenance issues, as opposed to reacting at the time of an equipment malfunction. Some maintenance software includes predictive maintenance functions, which monitor equipment conditions and predicts when service should be performed. As one might expect, common maintenance management features such as asset tracking and work order management were requested the most. Excluding these, however, the next most commonly requested features were more surprising: inventory management and reporting (both at 37 percent of the requested features), which are typically available either as add-on modules or through separate software that is not specific to fleet maintenance management. This is in line with our findings that most buyers are seeking more comprehensive software with diverse feature sets. Vendors offering fleet management systems with strong inventory and reporting capabilities are most likely to attract these buyers. Further, Koelsch says, mobile integration is particularly attractive to fleet managers who are commonly on-the-go, since they can enter and access information from anywhere. When it comes to deployment model, most buyers (79 percent) are undetermined. 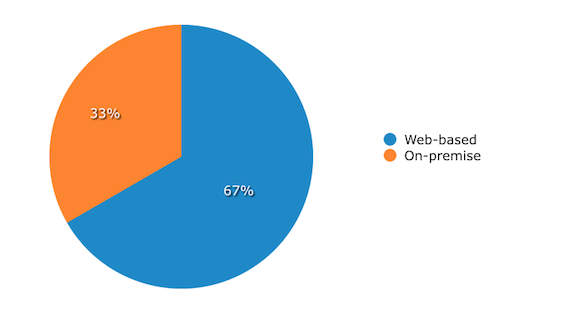 Of those who do have a preference, however, 67 percent are looking for Web-based, versus 33 percent who prefer on-premise. This is to be expected, given that Web-based software continues to grow in popularity. The majority of buyers (87 percent) say there are between two and 500 employees at their company. Only 13 percent have more than 500 employees. The buyers in our sample represent primarily small to medium-sized businesses, and may not be indicative of the market as a whole. Most of the buyers we spoke to manage fewer than 100 assets or vehicles, and are looking for a comprehensive, fleet-specific maintenance management system to help improve organization and efficiency. The majority of buyers have no determined preference for the method of deployment. Those who do, however, are looking for Web-based systems with expansive sets of features that make fleet management more convenient. Software Advice regularly speaks on the phone with organizations seeking new fleet management software. 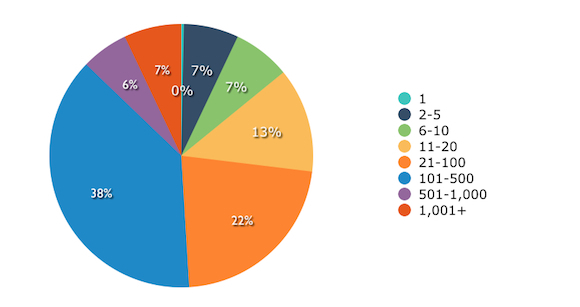 To create this report, we randomly selected 385 of our phone interactions from 2013 to analyze. If you’d like to further discuss this report or obtain access to any of the charts above, feel free to contact me at taylorshort@softwareadvice.com.